The EU’s refugee agreement with Turkey has been in force for two years. It was signed on March 18, 2016, in an attempt to solve one of Europe’s most pressing problems: the enormous influx of refugees. While Syrian refugees were looking for safe countries where they and their families could live, EU-Turkey relations were placed under a huge strain. What happened in the second year of the agreement? According to the United Nations, Turkey has been hosting 2,900,000 refugees. Turkey, however, says that their number recently rose to around 3,500,000. Turkey repeatedly threatened to terminate the agreement because, firstly, the EU has not paid the stipulated amount, and secondly, the visa freedom for Turkish citizens provided for under the agreement has not been implemented. For the EU, the question has been how to get the money together, while for Turkey the more important issue has been when the money would arrive. According to Dr. Cigdem Nas, president of the Foundation for Economic Development, the main hurdle has been the differing views held by Turkey and the EU on how the funds should be used. While Turkey has been applying pressure and, above all, has wanted to satisfy the overriding needs of the refugees, there have been delays because the EU member states’ funds have had to be monitored by the EU, she says. Asylum policy expert Dr. Basak Yavcan says that a lot of money has been spent on the high administrative costs of international civil society organizations. For this reason, less money has reached the refugees, she explains. How much has the EU paid so far? Under the agreement, Turkey was promised €6 billion in financial aid, to be used by the Turkish government to finance projects for Syrian refugees. According to the EU Commission, €3 billion has already flowed into Turkey to cover the costs of educating half a million Syrian children. The EU Commission decided on Wednesday that the second installment of €3 billion, promised under the refugee agreement, would be made available. The Turkish government, on the other hand, declared that it had so far received €1.85 billion from the EU. Financial assistance from the EU fund reaches Turkey through projects. The aid is not delivered to the government’s coffers. How many refugees are in Turkey? From 2016, as a result of the agreement, the number of refugees entering Europe illegally via the Aegean Sea decreased. Even though numbers were far below those of 2015 when the crisis began, Gerald Knaus, the mastermind behind the refugee pact and chairman of the European Stability Initiative (ESI), believes the agreement is in danger. According to Knaus, in the first half of 2017, almost 9,000 people came to Europe via the Aegean Sea, while in the second half of the year this figure had risen to 20,000. But according to the EU Commission, the number of refugees who came to Greece via Turkey fell by 97 percent compared to the period before the agreement. Under the agreement, Syrian refugees are exchanged between Turkey and EU countries. The arrangement is that the EU sends all Syrians who reached the Greek islands illegally after March 20, 2016, back to Turkey. In return, legal Syrian refugees are accepted into the EU. Because return procedures in Greece are slow, only 1,564 Syrians were sent back to Turkey between 2016 – 2018. In addition, a further 600 Syrians were sent back to Turkey under the agreement between Turkey and Greece. In exchange, 12,489 Syrians from Turkey were resettled in EU countries. Germany took in 4,313, the Netherlands 2,608, France 1,401 and Finland 1,002 Syrian refugees. The EU member states Hungary, Poland, the Czech Republic, Bulgaria and Denmark did not accept any refugees at all. What is the situation for refugees in Turkey? Syrians in Turkey do not have official refugee status. For this reason, their conditions do not meet international standards of protection. Around 1,000 Syrians are placed under temporary protection per day. Asylum policy expert Yavcan says that more than 3.5 million Syrians are under protection. This status gives them the right to education and health care. Cash aid for families is conditional on sending children to school. Because of this, 65 percent of school-age refugees receive an education, Yavcan says. 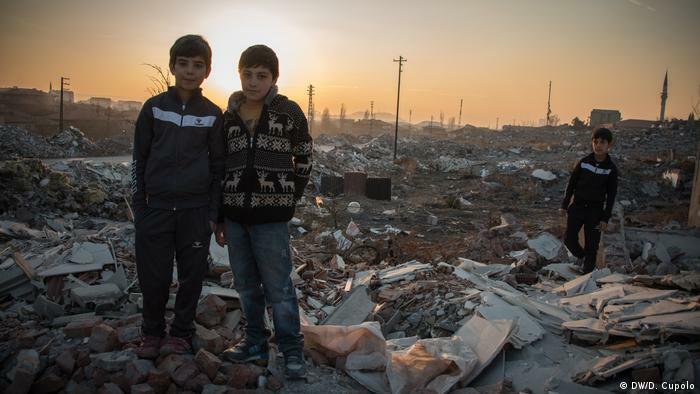 What is the future of the Syrians in Turkey? The EU is making further billions of euros available to support refugees in Turkey. But what is this money to be used for? Nas says that to avoid delays like those caused by the first aid installment and to ensure that the resources made available by the EU are more transparent, the city councils in Turkey should also have to submit project applications. Nas explains that while the first half of the aid focused on meeting refugees’ immediate needs, the second half must be used for cultural integration, language learning, vocational training and employment. The most important thing for Syrian refugees now, according to Yavcan, is that they learn the language and find a job. She says that currently, only 20,000 Syrians have a work permit and at least 800,000 Syrians work illegally, many of whom are children.